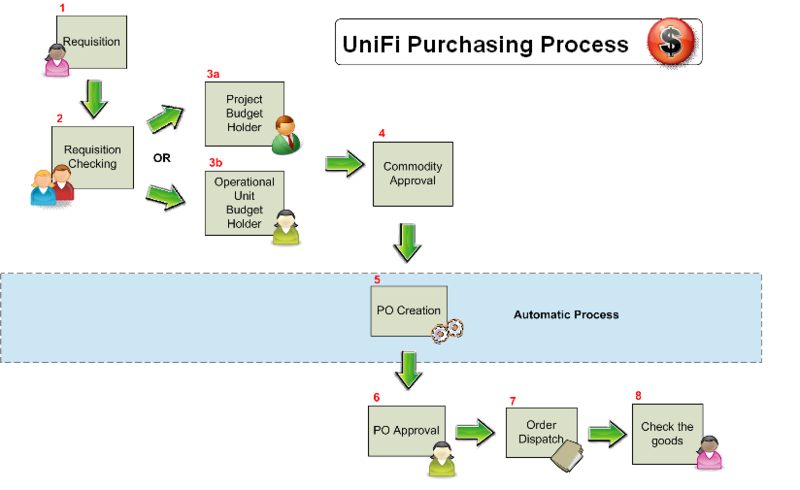 September 2014 - Purchasing workflow diagram updated. Dec 2017 - Updated Cargo Network link in section 7.3.1. Jan 2018 - Removed references to petty cash from sections 4 and 6. April 2018 - New topic created; procedure moved from 9.40.01 Procurement to 9.40.05 Purchasing. Administrative amendments made in response to implementation of Procurement Policy. December 2018 - Approval Authority updated to Director, Governance & Risk. This document defines the processes involved in the procurement of goods and services on behalf of and for the University. 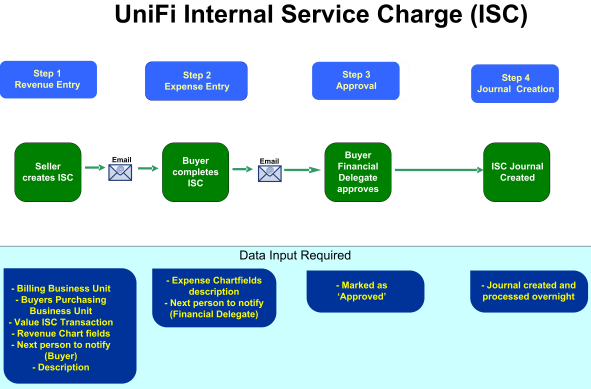 Internal vendor - Organisation units within the University supplying goods or services via a UniFi  catalog. External vendor - An enterprise, known to be capable of supplying required goods and/or services, which is not owned or operated by the University. These procedures apply to the acquisition of all supplies, services and capital works made by the University’s (including controlled entities) staff, students or contractors, either purchased or leased from suppliers external to the University for and on behalf of the University. The acquisition of goods includes the purchasing and leasing of goods. The acquisition of services includes services provided by contractors and consultants, but excludes payments to staff of the University via payroll. Individual with authority to approve a purchase order. In order to achieve an appropriate segregation of duties, Officer #2 and Officer #4 MUST NOT be the same person. Officer #3 and Officer #4 in the purchasing function may be the same person. It should be noted that an approved purchase order is effectively a commitment to pay for the goods and services on behalf of the University and is contractually binding. Approving a purchase order is more than simply approving an order – it is also effectively approval to pay if the vendor delivers according to the order. The first stage in the eProcurement process is the creation of a requisition. A single requisition can be created for goods and services obtained from each vendor. Requisitions can be created for both external and internal vendors. However, the accounting entries generated for external vendors are different to those created for internal vendors. Requisitions can have multiple line items and multiple cost allocations (using the Chart of Accounts). Requisitions can be entered in Australian dollars or other currencies such as US dollars. The system generates a foreign currency conversion so that the transaction can be reported via the General Ledger in Australian dollars. Once a requisition is created it is routed to a Finance Officer (Purchasing) for checking and approval. All University staff are able to create requisitions. A requisition can be edited at multiple stages. A requestor can edit a requisition for various reasons including changing the vendor, changing the quantity and changing the items. In each case the requisition must be resubmitted for approval. A Finance Officer (Purchasing) can also edit a requisition – typically for similar reasons to the requestor. A Finance Officer (Purchasing) may also change the project ChartField distribution lines or remove a project ChartField. An edited requisition must be resubmitted for approval. Requisitions can be cancelled by requestors, Finance Officer (Purchasing) and organisational unit Budget Holders. A requisition can be denied by the organisational unit Budget Holder/Commodity Approver and returned to the requestor with a note regarding the reasons for the rejection. Denying a requisition does not necessarily mean the requisition will be cancelled. The organisational unit Budget Holder/Commodity Approver may simply ask for the requisition to be edited in some way or for additional information to be gathered regarding the proposed purchase. A requisition must be approved before it moves to the next stage in the purchasing process. The organisational unit Budget Holder/Commodity Approver can deny or approve a requisition. Once a requisition has been approved, a purchase order is automatically created by the system. It is University of Queensland practice to ensure probity is applied to the management of purchase orders. No purchase order can be duplicated or provided to a UQ staff member. All original and/or copies of purchase orders must and will be supplied solely to the vendor. This practice reduces the risk of misuse of purchase order information and the potential of fraudulent misuse of the vendor’s details. *Note: UQ staff members who need purchase order information can also run a Purchase Order Summary Report. This report gives the user all the information that appears on the official purchase order. It can be run for a single purchase order or a group of purchase orders. The University has entered into an agreement with Cargo Network (International) Pty Ltd for the provision of all customs brokering services. Contact the Customs Supervisor, Cargo Network International (www.cargonetwork.com.au/links.php  ) for assistance with all matters in relation to the import (and export) of goods. Cargo Network International will invoice organisational units directly for the cost of the services provided. Purchase orders that are denied by the Financial Delegate must be cancelled by the Finance Officer and cannot be edited. Where an order that has already been sent to the vendor has to be cancelled, legal considerations must be examined. Clarification on any matter should be directed in the first instance to the Legal Office . Receipting involves the process of physically receiving goods and services and ensuring that they are in accordance with the purchase order. Goods that are clearly defective should not be receipted – refer to the supplier’s return process and ensure the goods are returned to the supplier in a timely manner. Alternative supply arrangements need to be made with the supplier. Where an order is incomplete – i.e. some items are missing, a partial receipting process should be followed as per section 7.4.1 Partial Receipting. 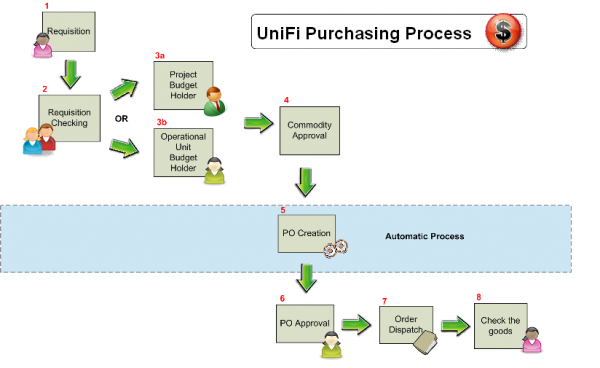 When goods or services are received, they must be receipted in the UniFi  system – preferably by the requestor. The receipting process allows the three way matching process to operate – i.e. purchase order must match the receipt which must also match the invoice. If the three components do not match, the payment of an invoice cannot be effected. A partial receipt is completed where there has been a partial delivery of goods or services. The details of the partial receipt should be entered into UniFi . When the balance of goods or services are provided, a further partial receipt should be processed. If an item is faulty or is not consistent with the original purchase order, it should be rejected. It is important that the University does not take delivery of goods or services that are defective in some way. If goods are found to be defective after they have been receipted, they should be returned to the supplier and a credit note requested. The receipting process cannot be reversed. Refer to the supplier’s instructions for returning goods. Regular or periodic orders for the same goods or services should be processed as an annual order or standing order. Annual orders are processed in the same way as a normal requisition. Annual orders should only be created to cover the period from January to December. If a greater period is required, a second annual order should be created in the following year. Annual orders with transactions exceeding 100 should be split to make them easier to manage. This can be done by providing separate lines within a singular order e.g. one line for each quarter or by having multiple orders e.g. one order for each quarter. Where trade-in of an existing item is included in the acquisition of a new item, the requisition and purchase order must only show details of the new item and its cost. The cost of the new item being purchased should be charged to the appropriate expenditure account. Refer to PPL 9.40.03 Trade-Ins  for further information. Portable and attractive items are specifically covered in PPL 9.50.03 Portable and Attractive Items . In order for portable and attractive items to be tracked they must be purchased via a purchase order. Item categories beginning with “PORT” are used to identify Portable and Attractive items. Assets with a value of $5,000 or more are capitalised and are specifically covered in PPL 9.50.02 Property Plant and Equipment . Assets MUST NOT be acquired using a corporate credit card. The UniFi  system allows the user to choose a particular item category (a category beginning with “ASSET” should be selected) and the system then automatically capitalises the asset and adds it to the appropriate asset group within the Asset Register. Appropriate depreciation rates are also automatically applied. As the capitalisation process is driven from the purchase order data, it is essential that the purchase order data is checked and is correct. If a purchase order for the purchase of a capital item is receipted twice, a second asset may be created. If this occurs, the person who receipted the goods must email the details to assets@fbs.uq.edu.au  to arrange for the Asset Register to be adjusted accordingly. It should be noted that the return of goods after the goods have been receipted and the asset created does not lead to an automatic reversal of the asset. The organisational unit must initiate the reversal of an asset by completing an Asset Disposal Form  and forwarding it to Assets Unit within FBS . The purchase of dangerous goods and hazardous substances are governed by specific UQ Occupational Health and Safety requirements . University corporate credit cards CANNOT be used for purchasing dangerous goods or hazardous substances. An Internal Service Charge (ISC) relates to transactions that occur between organisational units within UQ. Internal Service Charges typically relate to services such as printing, audio visual and other fee for service type services. Are not generated for transactions with external parties or associated organisations that have their own Australian Business Number (ABN). These transactions should be processed by raising a requisition purchase order or raising a bill/invoice. Do not relate to transactions which are ordered via an internal catalogue. Whilst purchases from an internal catalogue follow the same requisition/purchase order process, accounting entries for internal catalogue purchases are generated automatically (and eliminated automatically) via the UniFi  system. Organisational unit requests service from another organisational unit via a Request for Internal Services Quote . Terms are agreed – including price, timeframes, deliverables etc. The terms would usually be agreed in writing and approved by a Head of the organisational unit. The UniFi  system is not involved in any of the above steps. The generation of accounting entries does not commence until the service provision process has been completed. Service Provider raises accounting entries. Transaction details are completed and automated email link is sent to the Service Receiver. The Service Receiver reviews the transaction details. If they are correct, the Service Receiver enters the General Ledger account string to which the charge is to be allocated. If the transaction details are not correct, the Service Receiver can reject the transaction and it will be returned to the Service Provider. The Approver is then selected and an automated email is forwarded. If the transaction is approved by the Approver, the general ledger is automatically updated by the system. If the transaction is rejected, it is automatically recycled so that amendments can be made. The process is relatively automated, but it is incumbent of the Service Provider and Service Receiver to ensure that all the documentation is correct. Buying from an internal store is the same as buying from an external vendor catalogue except that there is no invoice for the internal transaction. Once internal goods or services have been receipted, the system generates the relevant accounting entries. Internal Stores transactions are flagged for elimination purposes. Purchases from the internal stores are not required to be disclosed to the Queensland Government Chief Procurement Office (QGCPO) for reporting purposes.